Bristol is a great city, but it has major problems, such as homelessness, food poverty and personal debt. It is both a city of opportunity and one of need. At Christian Action Bristol, we are building an online community and a new platform to connect people across Bristol, inspiring them to support, minister and serve their city through volunteering, prayer and action. We want to release the full potential of the Christian community to create positive change in our city. 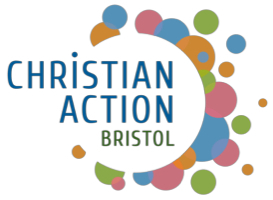 Christian Action Bristol focuses on social action and politics, working with and supporting charities, churches and other initiatives that work in Bristol. Through social media, we signpost the needs of the city and make it easier for people to get involved by linking to current projects, events and other opportunities. We want to encourage collaboration and connection, and inspire Christians to make a difference in their community. The heart behind Christian Action Bristol is to see our city transformed for good, releasing its full potential and building Bristol as a city of hope. If you are a charity, church, individual or other initiative in Bristol, working or interested in the spheres of social action or politics, please do get in touch with our Social Media Manager, Abigail Flynn, at christianactionbristol@gmail.com. Follow our social media pages (facebook, twitter, instagram), visit our website and contact us with inspiring stories, events and particular requests for support (e.g. donations or volunteers).